It finally arrived! Yesterday, the very first scarf in my debut collection of modern silk scarves was delivered to my studio. I wore my new scarf with a black trench coat as I walked to the neighborhood ‘candy store’ to purchase a bottle of champagne. It was time to officially celebrate this milestone, just as soon as my husband arrived home from work. For me, this isn’t just a scarf. It’s the nine months of hard work I spent on it that makes this silk square so important. My little dream is now a physical reality. And because it’s real, it’s no longer perfect. Only ideas are perfect. Instead it’s my beautiful imperfection. Something I’m proud to share with you. A celebration of strength and femininity, this brightly coloured design combines bold floral graphics with delicate pattern. Wear it when you want to make peace, not war. 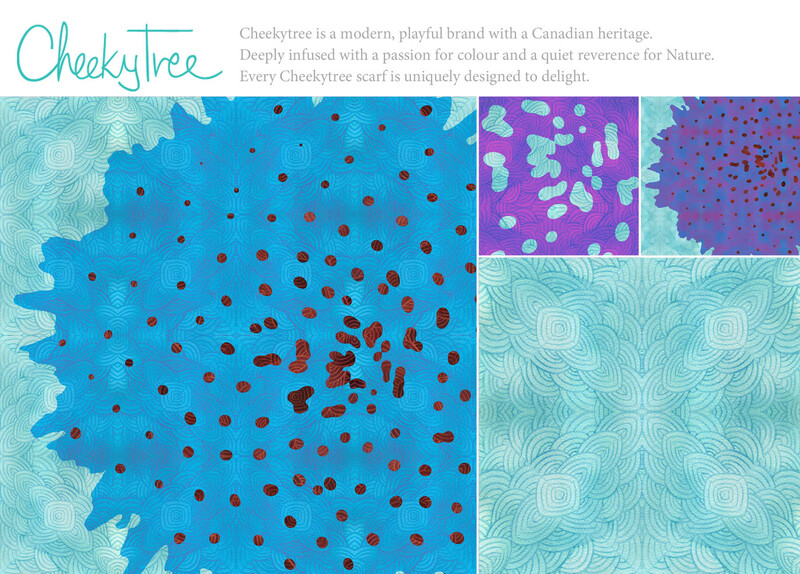 This entry was posted in art, fashion, Life and tagged designed in Toronto, Flower Power, limited edition, Made in USA, scarves, textile design by Lila Cheekytree. Bookmark the permalink. Congratulations Lila! It looks beautiful!!!!!!!!!!!!!! Thanks Patti. The real thing is even better. It feels wonderful too. Wow! Truly brilliant – well done you! CONGRATULATIONS! What a milestone! Definately worth a bottle of champagne and a day of reflection. You’ve come a long way and learned a lot. I am very, very happy for you Lila. Lovely! Both you and the scarf! Thanks Sandra. I think it’s important to be able to feel the scarves. You just can’t see the true colour and detail on a computer monitor. My hope is to find the perfect little boutique here in Toronto to sell them. Well done my lovely Lila!! It’s only noon here but I’m considering opening a bottle of wine and celebrating !! Love to you….D. Thanks Diana! No drinking without me! Congratulations, how exciting for you. Wishing you much success with this wonderful project you have designed. A beautiful creation of colour Lila! Thanks Susy. The colours aren’t as psychedelic as the Flower Power name might suggest, mostly brilliant blues and purples with bit of pink and bright orange. Congrats Lila – it’s beautiful! There was an article in the Globe & Mail that I read this morning in the Life section online about scarves being the ultimate accessory. It’s a video on how to wear them otherwise I would have sent it along. Thanks Kim. It’s true, the scarf is the ultimate accessory. It can totally transform a simple outfit and give it some French chic. Congratulations – such a beautiful scarf and such joyful news! I’m so proud of you! Yeah! Put me on the list to buy one! Congratulations! Thanks Wanda! I’ll be sure to let everyone know when they are available for sale. I could not be more excited or proud of you! Can’t wait to see you. Excellent….love it and congrats! I need one!!! Thanks Elizabeth. Wait until you see my next scarf which is called Wing It. I know you’ll love it. It should arrive next week. Sooo proud of you.. I’d love to buy the first one… or one of the first ones. Congratulations! When do we get to buy and wear them? Thanks Cheryl. News to come about how to purchase. I’m not quite ready yet.